Boston.com had an online chat with one of the original Ghostbusters himself Dan Aykroyd, so that online users may ask varying questions to the comedian/owner of House of Blues. One user asked Aykroyd, "I'm sure you get these questions a lot, so I apologize in advance...Ghostbusters 3? I've heard that the writers of the Office are currently penning a script? How is this coming along, and should we look forward to this movie seeing the light of day?" Mr Aykroyd's reply reveals that we may be seeing Venkman, Stantz, Spengler and Zeddemore alot sooner than we thought. Mr. Aykroyd said, "Script is commenced early summer. Hope to be in production by late fall 2009." Joy of joy's could we actually get to see a Ghostbusters film as early as next year? I truely hope so. Another user asked Mr. Aykroyd if he intended to work with Judd Apatow or Seth Rogen in the future. Aykroyd replied, "I would be happy to collaborate with Judd and Seth on project should they remember who I am." He also commended of the two and said he was a fan of both their work. 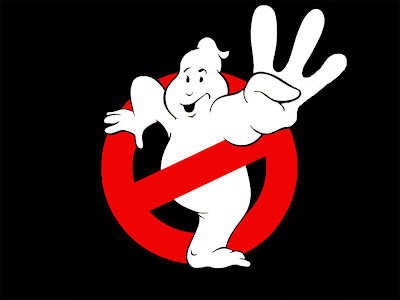 So for now it definately seems that "Ghostbusters 3" will be the original team and not feature any of the Apatow clan. Aykroyd could be just keeping things under wraps, but it is highly unlikely that Seth Rogen will be starring in GB 3. Aykroyd has confirmed that the original 4 ghostbusters will definately suit up. Some of the supporting cast is still up in the air. Rick Moranis is still in retirement and no word on Sigourney Weaver. Ohhh im looking forwaard to that. It seems like there is a ghostbusters revival: talks about the movie... the game... and from what i hear ray parker jnr is re-releasing the theme tune!